Welcome to the one hundred and sixty-third of my blog interviews with novelists, poets, bloggers, short story authors, autobiographers and more. Today’s is with mystery, science-fiction author and playwright Sally Carpenter. A list of interviewees (blogged and scheduled) can be found here. If you like what you read, please do go and investigate further. Morgen: Hello, Sally. Please tell us something about yourself and how you came to be a writer. Sally: I grew up in southwest Indiana, USA, and moved to Los Angeles 11 years ago. I’ve always wanted to write. As a child I read a lot of books because there wasn’t much else to do in a small town and books were free at the public library. After meals my mother washed dishes and I dried, and to pass the time I made up stories while we worked. As a child I cut pictures out of magazines and made up stories with them. In the evenings the family watched TV and I thought up my own stories for my favorite shows. I’ve always wanted to write professionally and I’ve written pieces over the years, but I was never “good at it” until recently. Morgen: Because you’d practiced presumably, and another interviewee who started young. Wow. What genre do you generally write and have you considered other genres? Sally: This book is my first mystery. I started out writing science fiction, but didn’t find any success in that field. Morgen: That’s a shame because it’s a popular genre. Sally: For a long time I worked at playwriting, but getting a new play produced by a professional company is nearly impossible and the small theaters hardly pay writers more than cab fare. Morgen: That’s something that Paul Hurst said in his guest blog only last night (although he was referring to musicians and free beer). What have you had published to-date? If applicable, can you remember where you saw your first book on the shelves? Sally: This answer will be quite short. 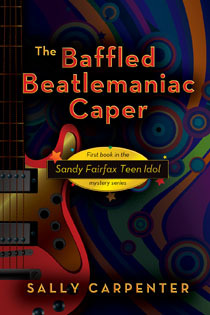 This is my first published book ever: The Baffled Beatlemaniac Caper, the first book in the Sandy Fairfax Teen Idol mystery series. Morgen: That sounds like fun; I love the Beatles. And I love the cover. How much of the marketing do you do for your published works or indeed for yourself as a ‘brand’? Sally: Branding? Isn’t that what ranchers do to cattle? Morgen: It probably feels like it sometimes. 🙂 Have you won or been shortlisted in any competitions and do you think they help with a writer’s success? Sally: I returned to college in mid-life to study playwright. Two of my short plays were regional finalists in the annual American College Theatre Festival. The contest selects six finalists from colleges in three or four states, so there’s plenty of competition. It’s unusual for a student to be chosen more than once. Although I didn’t win, the adjudicators had high praise for my work. One of the plays also won a creative writing award at my university. So I thought, “Hey! I must be a pretty good writer!” That gave me the encouragement I needed to keep on writing. Many years ago I submitted one or two short stories in a science fiction writing contest. I didn’t win any prizes, but one of the judges wrote a nice note that my work was good. Winning a contest is a good affirmation, but “losing” shouldn’t discourage a writer. A judge may dismiss a well-written piece for any number of reasons, such as a high number of equally good submissions or the judge just doesn’t like that particular style of writing or setting / plot / characters. Morgen: It’s unusual for a judge to pass comment so you did well. 🙂 Do you write under a pseudonym? If so, why and do you think it makes a difference? Sally: No, I don’t. I thought about a pen name but decided I wanted people to know I wrote this. Might be too confusing if I had to constantly explain who I was at book events. Besides, my name is easy to spell and when books are alphabetized by last name, “C” comes up close to the top. Morgen: That’s very true – almost as close to the top as “Bailey”. 🙂 Do you have an agent? Do you think they’re vital to an author’s success? Sally: No, I don’t have an agent. I tried soliciting an agent, but nowadays most of them are only interested in celebrities, published authors or writers who have already established a large fan base through a blog or other work. No agent wants to handle a first-time writer. Most agents and publishers only want books that are similar to what’s already on the market. Agents and publishers are telling authors the type of books they want to sell instead of letting writers create what they want. Agents don’t know what to do with something different. One agent said my book didn’t have a “strong enough hook,” yet my publisher said my “hook” was what attracted her to the project. Having an agent is no guarantee that he / she will actually sell your book. Some agents only send a book around to a handful of publishers and then give up if it doesn’t sell right away. Just about every writer I know who uses agents is on their second or third agent because the previous one didn’t work out. Morgen: I have heard that a few times. Sally: With the rise of small presses, e-publishing and self-publishing, a writer is no longer at the mercy of an agent / gatekeeper in New York City who decides for readers everywhere who’s worthy of publication. My advice for new writers is forego agents and to seek out the small presses. They’ll probably get a better response and they won’t have to share their royalties. Morgen: I’ve foregone… although I’m going the solo (with freelance editor) eBook route. 🙂 Are your books available as eBooks? If so what was your experience of that process? And do you read eBooks? Sally: I believe my publisher is looking at adding eBooks, so I’m sure my book will end up in an electronic format eventually. I still prefer reading the old paper-and-ink standard. I like the feel of paper and how books look lined up on my shelves. I’d rather spend my money on other things than an e-reader. And how do you sign or sell e-books at an author signing event? Morgen: Apparently it is possible. I’ve not seen it myself but http://kindlegraph.com/about explains all, although I have to say I’m not totally convinced and I love technology. Plus I agree with you, it’s not like having the paper book in your hand and I have a lot of those (books, that is, not hands). 🙂 What was your first acceptance and is being accepted still a thrill? Sally: My first acceptance was many years ago when I sold a short church play for a book that featured other religious scripts. I was paid a small amount like $30 or so. I was ecstatic and thought “Wow! I’m a professional writer now! I can make a living by writing!” Trouble is, after that first piece I accumulated far more rejections than checks. Morgen: I know that feeling, and we’re far from alone. So, the rejections, have you had many? How do you deal with them? Sally: In my lifetime I’ve had more than 200 rejections. I threw out most of them—too much bad karma to keep around the house. The first book I wrote decades ago had 50 rejections (never sold). Another book I wrote had 40 rejections (never sold). The novel I finally published had 10 or so rejections. Sally: How did I deal with rejection? Not well. I feel terrible and mope for a while. I say mean things about that publisher. Sally: Sometimes I stopped writing for a while. Sally: After the last major round of rejections I told myself I’d never write again. If I hadn’t sold this book, I would have packed away my pen for good. Sometimes an unpublished writer needs to change genres. Some authors, like myself, take a long time to find out what type of writing works best for them. Morgen: I’m still working it out, although I’m sort of down to two genres: dark and light. OK, they’re not really genres, are they? Crime and humour. 🙂 What are you working on at the moment / next? Sally: I’m working on the second book in the Sandy Fairfax Teen Idol series, The Sinister Sitcom Caper. When Sandy makes a guest appearance on a TV show, one of the actors falls down dead at his feet. Sitcoms rehearse and shoot in five days, so he has that amount of time to find the killer. Sally: I don’t write on my book every day because I have a day job. I tried to write or do marketing work in the evenings but sometimes housework or emergencies will get in the way. Morgen: They have a habit of doing that, don’t they? Sally: I try to keep weekends clear. That’s when I can sit down uninterrupted and well rested and work for several hours. I measure my output by how many chapters or scenes I finish. I don’t count the words. Sally: I prefer the term “writer’s procrastination.” I can find a million things to do to keep from writing but once I get started the words will come. Sally: “Writer’s block” is caused by the need for perfection. Writers expect a muse to whisper the entire finished piece in their ear and all they do is transcribe the words. Writers are frustrated when their first pass isn’t “perfect.” If I’m not sure what to do with a scene, I write another scene that I’m sure about and come back to the sticky part later. Better yet, I slop some words down on the page and go back later for revision. Morgen: “slop some words down” I love that. 🙂 That probably answers my next question, of sorts… do you plot your stories or do you just get an idea and run with it? Sally: When I take trips, I sit down with an atlas and choose which highways will get me to my destination most efficiently. If I don’t plan, I would make too many detours and possibly not end up where I needed to go. Making an outline in advance helps me navigate the book and I don’t waste time in dead ends. I have the ending in mind before I start. With a mystery, I have to know who dunnit so I can plant clues and red herrings. Morgen: That does make sense… it avoids the ‘huh?’ by the reader at the end. Sally: I have specific scenes that must take place as well as some “holes” that I fill as I go along. Since this book was my first mystery, it was a learning experience. After the first draft, I went back and added more clues and expanded the roles of some minor characters. The outline is flexible. As I reached the last chapters of the first draft, I found my timeline had a big gap in which nothing happened. I added a complication that improved the story and tightened the time line. But the basic structure of the story didn’t change. Morgen: You’ve just mentioned characters, do you have a method for creating yours? What do you think makes them believable? Sally: I spend a great deal of time researching my protagonist, teen idol Sandy Fairfax. I wanted to make him so authentic that the reader would feel they might have actually heard this guy on the radio. I read every book I found find on the subject, including autobiographies of real teen idols. I have concert videos of teen idol concerts and I’ve attended more than a few shows. For Sandy I wrote down the names of his records and his TV appearances. I made a timeline of what he did every year since high school. I’ll be fleshing out the members of his family in subsequent books. I even wrote lyrics to his hit songs. Although this much character work was time consuming, the upside is that for a series, I have plenty to draw on to keep the stories fresh. I chose the name “Sandy” because most teen idols have a first name that ends in the long “ee” sound—Davy, Micky, Bobby, Donny, Frankie, Freddy, Andy, Ricky. My character’s a blonde and “Fairfax” means “fair headed.” Sandy Fairfax is my hero’s stage name. His given name is Stanford Ernest Farmington Jr. His family calls him Ernest. “Farmington” is a Scottish name with its own clan tartan. The name “Ernest” comes from the American TV series “Legend” in which Richard Dean Anderson plays Ernest Pratt, a 19th century writer in the Old West who penned dime novels about the clean-cut hero Nicodemos Legend. The townspeople treat Ernest as if he’s really Legend and expect him to save them from trouble. In my books, Sandy played a detective on a TV show and people expect him to solve crimes. Since my book is about the Beatles and pop music, some of the women in the book are named after song titles—Valleri, Prudence, Pam, Helen Wheeler. Morgen: My goodness, that’s detailed… but then you’re writing a series so I’d say definitely worth getting to know your characters and it sounds like you’re having fun in the process. Who is your first reader – who do you first show your work to? Sally: A male co-worker was my first reader on this book. He was my “guy advisor” who made sure my hero talked and acted like a man. My friend also loved the story and his encouragement helped me through the early drafts. Sally: I do a tremendous amount of self-editing and I don’t expect that to change. The upside is that my publisher never asked me to make any changes on the mss. Morgen: Wow. What is your creative process like? What happens before sitting down to write? Sally: I have the scene worked out in my mind before I start writing. If it’s an action scene, I visualize it like a movie. I can’t sit down cold and stare at the page and hope words will appear. Morgen: They often don’t. Do you write on paper or do you prefer a computer? Sally: I use pen-and-paper for the first draft. I first started writing (I’m showing my age) before computers and I wrote first drafts by hand to save on typewriter ribbons. Staring at a blank computer screen annoys me and feels like a day job. There’s something about the brain-hand connection that’s organic and makes the creative juices flow. And on the computer I stop and make corrections instead of letting ideas pour freely. I type up my scribbles on the computer and edit from there. Morgen: I learned to type on an electronic typewriter so I’m not far behind you. What sort of music do you listen to when you write? Sally: I can’t listen to music while I’m actually writing. Any kind of noise distracts me. However, I listen to music when I’m taking a break from writing or while I’m searching for ideas. Since my book takes place at a Beatles fan convention, I played all my Beatles and related solo records. Sandy’s a teen idol, so I listen to music by The Monkees, Bobby Sherman, Shaun Cassidy and Peter Noone. I have other musicians (mostly from the 60s and 70s) that I listen to as well–even disco! Sally: I started writing my book in third person but it wasn’t working. I switched to first person and the character popped right off the page. First person let my character crack jokes and make asides to the reader and let his personality shine. I recently wrote a short story and that worked fine in third person. The type of story determines the point of view. Morgen: I think you did the write thing. It’s amazing the difference it can make. Do you use prologues / epilogues? What do you think of the use of them? Morgen: Absolutely, it should start with the action. Sally: With “epilogues,” I think, “I finished reading 300 pages and there more?” I don’t like prologues that are used to dump a load of back story, or build up an interesting character only to have him gunned down before chapter one, or to tease me about something that the writer won’t explain until the end of the book. Sally: Before I wrote this book I penned the first book of a proposed young adult action / adventure science fiction series. This was during the Harry Potter craze and I thought publishers would love another exciting fantasy series. I was wrong! After 40 rejections from agents and publishers I shelved it. If a publisher calls me up and expresses an interest, I’ll dust it off. Morgen: And your writing will be even stronger by then. What’s your favourite / least favourite aspect of your writing life? Sally: I love when a reader gets as big of a kick out of reading the book as I had writing it. I like to bring some fun and joy in someone’s life through my writing. The least favourite aspect is the expense. In the old days writers could get by with a typewriter but now a person needs to invest thousands of dollars computers, printers, websites, conferences, membership fees and promotional travel. It’s almost at the point where only the rich can write. Morgen: I have the equipment but yes, if I went to everything on / I’m invited to I’d be eating bread and cheese. If anything, what has been your biggest surprise about writing? Sally: That I could actually write a mystery. When I was a kid I never thought I could work out a plot or the clues. Morgen: I tend to think that now although as you say you can go back in and add the herrings. What advice would you give aspiring writers? Sally: Don’t get hung up on the talk about certain writers making millions of dollars with e-books or getting paid insanely huge advances or selling a zillion books or making huge movie deals. Too many authors expect that they’ll be the next major best-seller and become disappointed or even quit writing when the big bucks don’t come their way. Writers are often more concerned about getting an agent than getting their manuscript finished. First-time writers won’t be able to obtain an agent, let alone an enormous advance. Keep the stars in your eyes but your feet on the ground. Be realistic about your chances. Start with the small presses. Start, finish and polish your manuscript before worrying about marketing and contracts. You can’t sell a book if you don’t have one ready to go. Morgen: Absolutely… like you can’t edit a blank page. What do you like to read? Sally: I know so many local writers that I mostly read their work. I’m a member of Sisters in Crime and I support the other members who are published. I love anything by Steve Hockensmith or William Link. I still like the guilty pleasure of dipping into a Nancy Drew or Hardy Boys book. I picked up about 20 of them recently at a library bookstore. Morgen: A busy life… hopefully there’s writing your sequel in there somewhere. Are there any writing-related websites and / or books that you find useful and would recommend? Sally: “Forensics: A Guide for Writers” by Dr. D.P. Lyle has good basic crime scene information. The good doc also has a website about forensics and will answer medical questions from authors. “Don’t Sabotage Your Submission” by Chris Roerden is a must. “It Was the Best of Sentence, It Was the Worst of Sentences” by June Casagrande. Good advice on grammar. Morgen: All new to me, thank you for that. In which country are you based and do you find this a help or hindrance with letting people know about your work? Sally: I live just outside Los Angeles, which is a hotbed for writers, so creativity is in the air out here along with the smog. There are number of mystery bookstores, book fairs, colleges with creative writing programs and other opportunities for promotion. The Los Angeles chapter of Sisters in Crime is the largest SinC chapters (men can join, too). I signed up for the chapter’s Speakers Bureau, which means I can participate in author panels and other chapter promotional events. It’s a good location for mystery writers, both for inspiration and promotion. Morgen: I’ve heard Sisters in Crime a few times… 🙂 Are you on any forums or networking sites? If so, how valuable do you find them? Sally: I network through the Sisters in Crime listserve. SinC has chapters everywhere and an Internet chapter for those who don’t live near a chapter. The acquisitions editor at my publishing house, Sunny Frazier, has a network of writers on the Internet called The Posse. She connects members to promotional opportunities online and the members provide mutual support. Anyone can join The Posse by contacting Sunny at sunny69@comcast.net. Morgen: Ah Sunny… a regular guest here. Hi Sunny… as are the Posse members (hello everyone) 🙂 Where can we find out about you and your work? Sally: You can email me questions at scwriter@earthlink.net. You can buy my book at http://oaktreebooks.com/dark_oak_mysteries.htm. I’ll be putting up a website in the months to come. Morgen: Oh great, do le me know and I’ll add it to this page. What do you think the future holds for a writer? Sally: The Big Six publishers in New York City are loosing their monopoly on publishing. Since the Big Six are closed to unpublished writers, the newbies are heading for the small presses, e-books and self-publishing. With the rise of Amazon, writers are no longer dependent on bricks-and-mortar stores to sell their books. With the Internet, writers can query, sell and promote their work without agents or publicists. More first-time writers can publish books but they’ll have to work hard at self-promotion. The bad news is there’s so much “noise” on the Internet, finding an audience can be difficult. With so many writers’ blogs, nobody can read everything. The Internet audience is so fragmented that an author will have to guest blog endlessly to reach even a small number of people. And there are still readers who don’t read blogs or use computers, so authors will still need to use more traditional promotional techniques. Morgen: It is / there are… lots of opportunities for the new novelist to think about. Is there anything else you’d like to mention? Sally: Thank you for letting me ramble on like this. These questions have been fun. Morgen: Ah, thank you Sally. I’m so glad it wasn’t torture. Braxton stared at her, too stunned to take notes, but I took it in stride. Fans possess encyclopaedia knowledge of the minutest trivia. Sally Carpenter is native Hoosier now living in sunny Southern California. She has a master’s degree in theater from Indiana State University. While in school two of her plays, “Star Collector” and “Common Ground,” were finalists in the American College Theater Festival One-Act Playwrighting Competition. “Common Ground” also earned a college creative writing award. The plays received staged readings and productions in New York City. Carpenter also has a master’s degree in theology and a black belt in tae kwon do. She’s worked a variety of jobs including actress, freelance writer, college writing instructor, theater critic, jail chaplain, and tour guide / page for a major movie studio. She now works for a community newspaper. She’s a member of Sisters in Crime / Los Angeles Chapter. Update July 2012: “Baffled Beatlemaniac” is available as an e-book on Kindle and Nook. The book was an Eureka! Award finalist for best first mystery novel at the 2012 Left Coast Crime convention in Sacramento, California. I’m also working on the next book in the Sandy Fairfax Teen Idol series, “The Sinister Sitcom Caper.” This time Sandy’s a guest star on the lowest-rated TV show of the fall season. When an actor drops dead at his feet, he discovers Hollywood has more secrets than a lodge meeting. I really thought this was certainly a good read. For I am working on my first book presently and got some real good information . Great interview! I love getting to know more about the other members of Sunny’s Posse. Sally, I agree with you; I detest so-called “reality” shows too! Seriously, if that’s reality, Calgon, take me away! Best of luck with your novel. I found this interview very interesting. I like to learn about an author’s writing journey, and hearing their opinion of self-publishing vs. traditional publishing, agents, etc. I had an agent once, but she dropped me because I took too long to finish a book I finally placed on my own,my latest novel, The Girl in the Box, from Dundurn. I also had an English aunt who was a novelist and travel writer who told much the same story: she had an agent at one time, but advised me not to get one – she said she did a better job of selling her books than the agent did. Morning everyone. I went to a talk by English crime writer Stephen Booth last night and he couldn’t praise his agent enough. She stuck with him for 2 years with no sale then had an offer from Penguin which then had other publishers interested and ended up with an auction won by Harper Collins. He said without his agent he wouldn’t be where he is now. It was an interesting evening – I’ll type up my notes in the next few days and release them on the blog.